Process 1/4 cup sugar, flour and butter in food processor until mixture forms dough that pulls away from side of work bowl; press onto bottom of 9-inch springform pan. Prick all over with fork. Bake 25 min. ; cool completely. Beat cream cheese and 1 cup of the remaining sugar in large bowl with mixer until blended. Add vanilla; mix well. Add eggs, 1 at a time, mixing on low speed after each just until blended. Reserve 1-1/2 cups batter. Stir pumpkin, 1 Tbsp. (3 tsp.) cinnamon, 1/2 tsp. nutmeg and ginger into remaining batter; pour over crust. Add coffee granules to reserved batter; stir until completely dissolved. Carefully spoon over pumpkin layer in pan; spread to form even layer. Bake 50 to 55 min. or until centre is almost set. Run knife around rim of pan to loosen cake; cool before removing rim. Refrigerate 4 hours. Meanwhile, bring 1/2 cup remaining sugar and water to boil in saucepan on medium-high heat, stirring until sugar is dissolved; cook, without stirring, 10 to 12 min. or until golden brown. Remove from heat. Stir in seeds with wooden spoon; cook and stir 4 to 5 min. or until seeds are toasted and evenly coated with sugar syrup. (Note: Sugar will turn dry and grainy before melting completely. Just keep stirring.) Pour carefully onto parchment-covered baking sheet; cool completely. Beat cream with remaining 2 Tbsp. sugar and spices in clean bowl with mixer on high speed until stiff peaks form. Serve over cheesecake with the brittle. 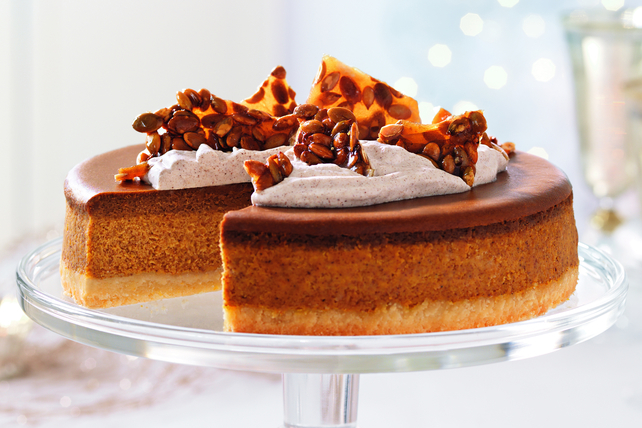 You'll know it's a special occasion when you get to enjoy a serving of this fabulous cheesecake. Pumpkin seeds are also known as pepitas. Cheesecake can be refrigerated overnight before topping with brittle and whipped cream mixture.